All the embedded videos below can be found on YouTube here. Watch except below. Read review. Also available on order through MGM Distribution at most record stores. Note: if you wish to purchase using PayPal and require delivery to a P.O. Box address please add that address to your PayPal account delivery addresses first. As Rhythms magazine’s Keith Glass has insisted, Glenn “should be trumpeted as one of our finest, an original and a craftsman of the first order” - an assertion well evidenced by this intimate and atmospheric performance, with The Sideshow, led by fine guitarist Stuart French, one unforgettable February night at Lizotte’s on the Central Coast of New South Wales. Drawing highlights from his albums of the past decade, Rattle The Cage, House of Mirrors and Exiles From Eden, with a sprinkling of new, unheard songs, this seasoned songsmith deftly blended the growling rockabilly whomper-stomper sound of Shing-A-Ling, Rust In The Tailfin and Asylum Blues, with the delicate insight of She Flew Away, The Best Of It and Invisible Ink and the quirky irreverence of Elvis At The Checkout, Close Encounter (With A UFO) and Pamela Anderson in a sweep across a musical terrain that could only be his own – one full of twists, turns and textures. Accompanying the ninety minute performance is a bonus Up Close & Personal interview conducted by Glenn A. Baker, delving into the songwriting process and uncovering intriguing information from the days of young psychedelic and blues bands, Sunbury festival performances, original LP releases and Cardier songs found on a million selling international album and a number one album and number one single in Australia - all interspersed with acoustic song snatches and some rare footage from the vaults. More Cardier than has been available over his entire career. Listen & download full sample from the live CD soundtrack of the DVD - for FREE! Click track name below to download. Glenn Cardier and the Sideshow live at the Harmonie German Club, Canberra on 21st April 2018. Direct recording from the sound desk. No overdubs. 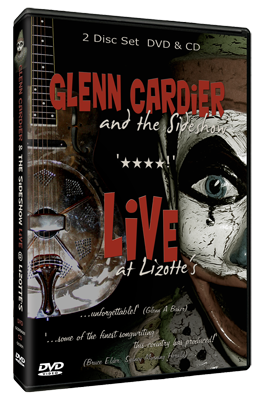 Glenn Cardier and the Sideshow performed this great rockabilly track from Cardier's triumphant gig early 2009, The entire show of Cardier originals has been captured on the DVD/CD set 'Glenn Cardier and the Sideshow - Live at Lizottes'. This single was released in 1980 and never came out on LP or CD; it was also Glenn's last recording for 22 years. Clip recorded for Music Express, Adelaide. "Expectations was my last single release by Festival Records. The B-side to that was a song called I Saved Annette From Drowning which is quite a nice little pop-rock tune too. They shot the clip one day in Adelaide while I was on tour with Spike Milligan. I can't remember the studio and those guitars are not mine. The filming was over in the blink of an eye and I never gave it a second thought until it resurfaced thanks to South Australian radio man Michael Hunter." Australian singer-songwriting legend Glenn Cardier, with his moving song Free To Fly, a dedication to comedian Spike Milligan. This song was recorded live at Music Warehouse, Tanunda, South Australia in 2005. A smoldering, swerving and growling performance by Glenn Cardier of his mighty song, Rust in The Tailfin (from his 2001 'Rattle The Cage' album). Captured live and intimate at Music Warehouse, Tanunda, South Australia, Glenn is one of Australia's finest exponents of blues-fuelled folk and roll. Catch him live if he is in your neighbourhood. From the new album by Glenn Cardier called Exiles From Eden. Glenn Cardier's growling blues mixes miracles, delusions and a sharp new jacket. Glenn's opening song for his 2008 Troubadour Weekend appearance - from his 2001 Rattle The Cage album. An enticing performance that immediately draws you back into the wonderfully weird and wistful world of Glenn Cardier. One of Glenn's magnificent timeless tunes - 'Butterfly Net', originally from his 1972 album - Only When I Laugh, performed here at Andrew Pattinson's 2008 Troubadour Weekend. For those who experienced this 'everyday maniac' back then - soak in the memories. Newcomers, just enjoy the magic on your first time around! Glenn's title track from his new album, performed at The 2008 Troubadour Weekend. Exiles From Eden is another one of Glenn 's finest melodies, together with his distinct lyrical storytelling that combines beauty & wonder, melancholy and hope. Superb. Cardier's penchant for rockabilly blues comes to the fore here in this tale of a circus gone wrong. From 2002's 'Rattle The Cage', Cardier uses open D tuning, a small bottleneck on the middle finger and a .61 gauge bottom string for the twang. Cardier plays a honky-tonk lick on his Style-O Beeton resonator (serial number 4!). Story about an alien offering eternal happiness to the world as we know it. From 2002's 'Rattle The Cage' this 'music-box' song captures Cardier's tragi-comic lyric style. Complete with laughs and coughs from the full-house Laycock Street Theatre crowd. Hilarious live performance of this (to date) unrecorded Cardier original. Christmas cracker by Cardier about a brawl that spontaneously erupts at the Carols. Enjoy! "It was thought for many years that most of the videotapes of the program had been erased during an ABC economy drive in the late 1970s, but recent estimates from the ABC indicate that as much as 90 percent of the series has survived, although regrettably most of the first year of the show was only videotape, which has since been erased." Glenn adds, "Flat Earth Rag underwent a name change. It became Christopher Columbus Rag and was the B-side to Till The Fire Dies released in the UK as a single. I left for England in '74 so I would have recorded the song on GTK prior to my departure. That's a nylon string Ovation I'm playing. They came with a pickup system installed and were a big deal back then." 2UE VIDEO: If you haven't heard of Glen Cardier, it's time you did! One of our finest singer songwriters, he's toured with Frank Zappa, Bob Geldof, and written songs for Olivia. Watch him perform here for Tim Webster.